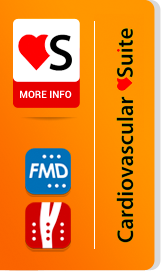 Vascular Age provides you a measure of the apparent age of your arteries, when compared with healthy people. If your vascular age is greater than your chronological age, you may be at more risk of developing cardiovascular disease (CVD) later in life. For example, if your real age is 45 and your vascular age is 55, this means that your blood vessels are more like those of a healthy 55 year old. As a consequence, you are at a higher risk for developing CVD than that based solely on your age. In addition to this the Vascular Age calculator also shows the percentile of your intima media thickness (IMT) with respect to that of normal healthy people. In example if your IMT gets a 90-97.5 % percentile this means that at least the 90 % of normal people has a IMT value smaller than yours and only 2.5-10 % of normal people has a IMT value greater than yours. This means your carotid artery wall is very thick with respect to normal people’s artery thickness. The effects of early vascular aging may best be managed by early intervention. The Vascular Age is not intended to provide an assessment of your state of health and should not be used for diagnosis or be used as a substitute for medical advice. Always consult your doctor or healthcare professional to make healthcare decisions or before starting any diet or exercise program. "); //$('#vascularage').append("round(V.A.) = "+Math.round(parseFloat($va))+ " y.o. "+"
"); //$('#vascularage').append("ceil(V.A.) = "+Math.ceil(parseFloat($va))+ " y.o. "+"